In an effort to improve nutrition of millions of office going Indians, the Food Safety and Standards Authority of India (FSSAI) launched the SNF@Workplace initiative (safe and nutritious food at workplace) today. This initiative is an effort to stem the increase in obesity and non-communicable diseases across the country. Most office goers consume at least one meal at the office and this initiative hopes to ensure that this meal is healthy and nutritious. Unsafe food leads to illness and absenteeism which reduces productivity and costs our economy as much as Rs 60,000 crore—9 per cent of our Gross Domestic Product (GDP). The initiative would set processes and protocols to help people imbibe this culture of good food into their lives. “We are not mindful of what we are eating,” says Pawan Kumar Agarwal, CEO of FSSAI at the launch. To aid workplaces and build a policy framework, FSSAI has also released The Orange Book: Your Guide to Safe and Nutritious Food at the Workplace. This sets down the role of stakeholders such as the administration, canteen establishment and the employees at a workplace in ensuring safe food. 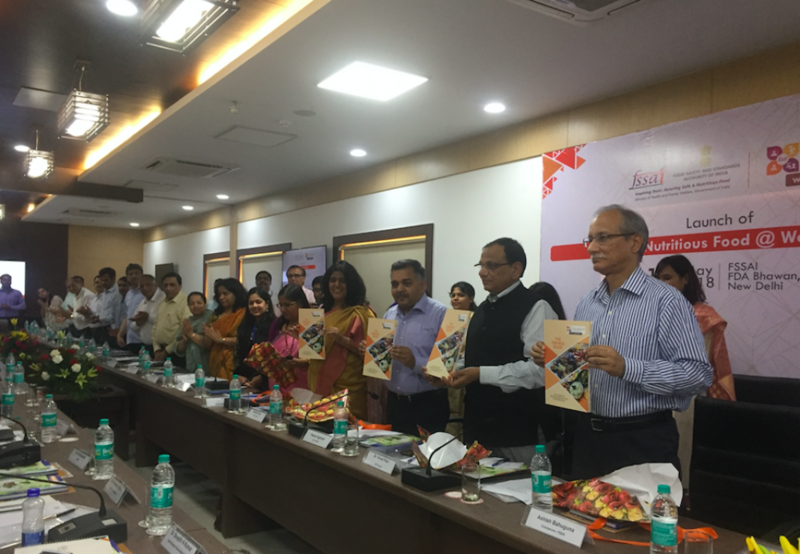 The book was released by Vinod Paul, member NITI Aayog. According to him, in order to benefit from the demographic dividend, it is important that employee productivity is improved through efforts like this. Ambrish Mithal, head of the department of Endocrinology and Diabetes at Medanta—the Medicity said that people spend long time at offices and availability and access to healthy food options here has to be easy. The country’s premier food watchdog also plans to evaluate organisations based on systems put in place to promote health and wellness. These includes initiatives such as using licensed vendors for the canteen, personal hygiene of food handlers and safe food practices as per Food Safety Management System guidelines and having trained and certified food safety supervisor. Empanelled audit agencies, in accordance with the Food Safety and Standards (Food Safety Auditing) Regulation 2017, will be assigned to evaluate interested workplaces. Reviewed workplaces will be given rating with 3,4 or 5 stars based on quality of food and canteens and well as the activities focused around ensuring food safety. FSSAI will train people responsible for providing food in workplaces and help organisers create awareness about good food too. Paul urged organisation to announce on this Independence Day that all government offices and private sector would ensure that safe food is served in offices. Before SNF@Workplace, the FSSAI had launched SNF@Home and SNF@School. They now plan to launch SNF@Hospitals in a month's time. This will ensure that safe and nutritious food is served to patients at hospitals.